Results from 2 test samples provided by Cliff Stanley. As a test of the decrepitation technique on samples from meguma terrane style gold deposits in Nova Scotia, 2 samples, CRS-1C-A and CRS-1C-B, were analysed. The Dufferin deposit is a classic saddle reef deposit hosted by the Goldenville greywackes, with up to 2 m thick saddle reef veins along slate interbeds, and minor conjugate or extension veins and spur veins cross-cutting these. It is actually in production, and they have discovered 10 saddle reefs in the first 350 m of vertical, some of which have multiple mineable veins. The deposit is classified as mesothermal saddle reef auriferous quartz vein type, with significant muscovite, ankerite, pyrite, arsenopyrite and chlorite alteration envelopes. The 2 Dufferin samples are from the same saddle reef vein but one is at the nose and one is approximately 10 m down the limb to the north (I can get determine the actual distance with some maps). 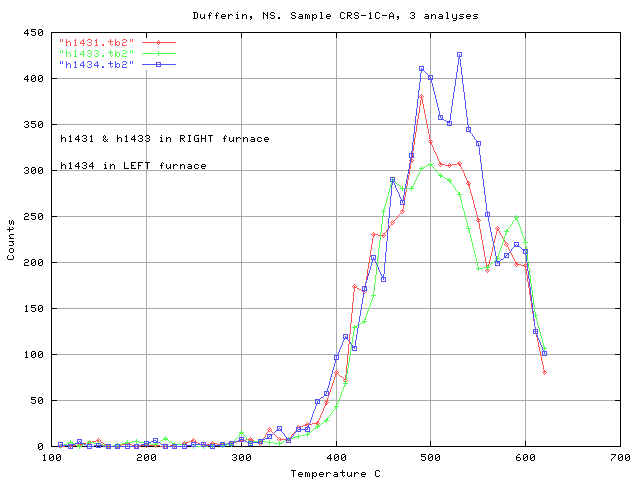 The 3 analyses of the A sample in 2 furnaces show "normal" reproducibility. 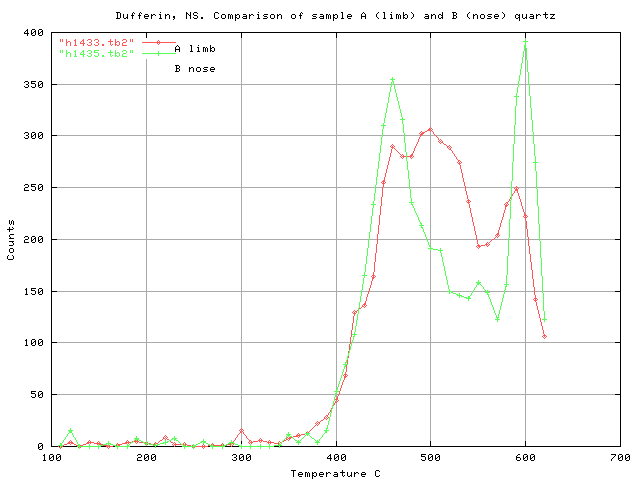 In the interpretation I pay more attention to temperature changes (of more than +/-20C) than to amplitude changes. Based on the lack of decrepitation below 300 C, there is "no" CO2 in this sample - well, absent or too low to detect by decrepitation. 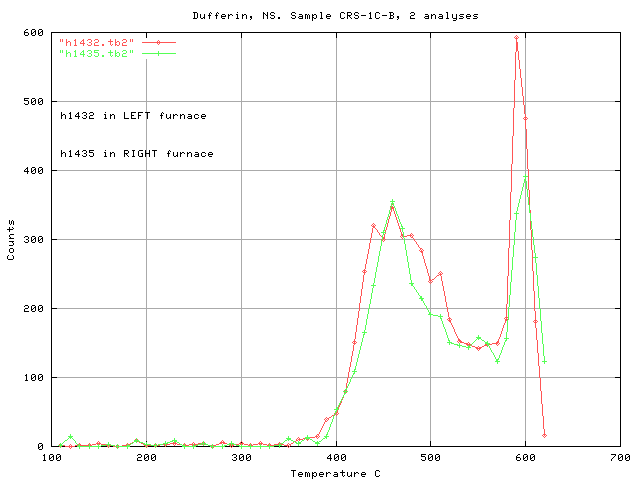 The B sample was analysed twice in different furnaces and temperature reproducibility between furnaces is good. Again there is "no" CO2 peak. Note the lower temperature of the main peak - 450 C. The peak at 590-600 C is due to alpha-beta quartz inversion facilitated decrepitation and is not very diagnostic. In comparing the A and B samples, the saddle limb versus the saddle nose, there is an interesting temperature shift from 450 to 500C! It is very interesting to see such a difference between quartz samples so closely related, saddle position wise. But they were visually distinct (grey versus white) so they are quite possible of very different generations even if they appear to be part of the same saddle reef. I'm not sure if the change in the peak amplitude at 600 is interpretable geologically - it would need more sampling. However, I usually am unable to use this peak in interpretations. The difference between the A and B samples is significant enough (50 C) that this could be reliably used to discriminate these samples. Although in this case quartz colour can do the same! The instrumental variance is far less than the between sample variance. With the differences observed here, as well as the differences seen at "the ovens" deposit, I consider that decrepitation is useful in distinguishing quartz types in these types of deposits in NS. We can use decrepitation to distinguish quartz variants, even when they are closely related as are the 2 samples examined here. The relationship of these observed decrepitation differences to gold grades or gold potential is unknown and not determinable in this very small test study. It remains to be shown if these observable decrepitation differences can be put to use in exploration and/or mine development and continuing research would be needed to resolve this properly.